Several months ago my tennis shoes were breaking. There were holes in the top of each toe and the soles had come loose in front so that they flapped. They were ready to be thrown out, but I repaired them with duct tape. I learned this technique from my college-age nephew Daniel who repaired a pair of sandals with duct tape. When Daniel started paying for his own clothes, he discovered that some of the most interesting and unique attire in Charlottesville could be found at the Salvation Army. Daniel is on his way to being a wealthy man. Wealth is what you save, not what you spend. Over a thousand millionaires were interviewed and two books (“The Millionaire Next Door” by Thomas J. Stanley and William D. Danko and “The Millionaire Mind” by Thomas J. Stanley) published the findings with some surprising results. The real lifestyles of the rich in Charlottesville would get very low television ratings. The rich are frugal to the point of being miserly in their spending, but they are also willing to take risks by investing their wealth in the markets, their businesses, and themselves. Their wealth is generated by what they save, multiplied by the magic of compounded investment return. But their magic is first and foremost in how not to spend money. They don’t buy expensive shoes or designer suits. They take their lunch in a brown paper bag. They enjoy activities that are free. They clip grocery coupons. They fly the red-eye stand-by. They don’t flush every time. They buy a used car. They live in a modest house. They repair their shoes with duct tape. You wouldn’t know they were millionaires unless you looked at their investment portfolio. Millionaires save at least 15 percent of what they earn – often more. They live well below their means, and they would describe themselves as frugal. Want to know how to be a millionaire in just 20 years? Save $1,100 a month and invest it in the stock market averaging 11.5%. Saving $1,100 a month is our recommended 15% minimum if your income is $88,000 a year. Lower income families may require a greater percentage or longer saving and investing to become a millionaire. For as little as $56.43 a month from age 20 to 65 your saving and investing will also grow to a million dollar portfolio. Consider two people buying new tennis shoes. One person decides to “live rich” and buys a new pair of shoes each year for $50. 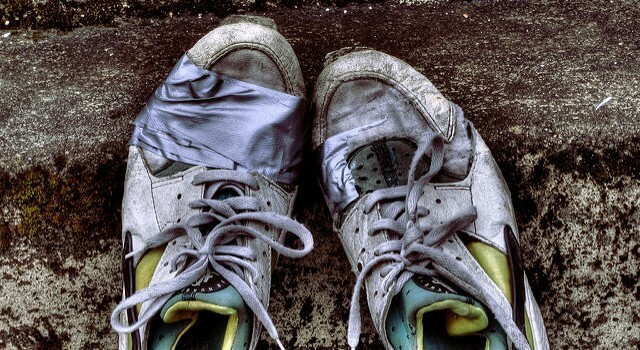 The second person decides to “be rich” and repairs their shoes with duck tape. This frugal investor makes his shoes last two years and invests the $50 savings every two years in stocks earning 11.5%. Within six years, the frugal investor’s $150 savings has grown to $220 and is earning enough to buy him a $50 pair of shoes every two years. Within nine years his $250 savings has grown to $440 and is earning enough for him to “live rich” and buy a new pair of $50 shoes every year. After 28 years, the frugal investor’s $700 savings has grown to $28,000. His investment is earning enough to buy him a new pair of shoes every month. If he remains frugal for 46 years, his $1,200 savings will grow to $50,000 earning $480 per month. $50,000 just by lengthening how long you make a $50 pair of shoes last! Many people mistakenly believe that their financial well-being is outside of their control. It isn’t. Repair, make do, or do without! Your financial future is made is every day’s decisions to spend money or save and invest.